Members of the Eureka Humboldt Visitors Bureau tour Huckleberry Hill Farms. 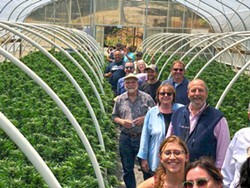 As the Eureka-Humboldt Visitors Bureau's board of directors continues to contemplate its future cannabis efforts, some of its members recently took a tour with the aim of discerning whether the plant might one day be able to mingle among our redwoods, coastline, food, wine and Victorians in the agency's marketing efforts. As the Journal reported back in May, when the bureau board voted to keep cannabis businesses on a "separate but equal" marketing track, the board seems deeply divided on the subject. On June 14, in hopes of helping the marketing groups appreciate the possibilities of canna-tourism, the Southern Humboldt Business and Visitors Bureau sponsored a tour for members of its Eureka counterpart, the Humboldt Lodging Alliance and others. Kevin Jodrey, well-known cannabis personality, led the first stop at the One Log House where he is a partner. He introduced the group to an integrated traditional tourism and cannabis business —from the kitschy but cute house made from one redwood log to the gift shop/cafe to the cannabis store that sells locally grown products. If the tour members were expecting giant marijuana leaf posters and flashing neon signs, the natural wood interior and discreetly displayed merchandise soothed their fears. Jodrey started out by reassuring the group that the goal should be to integrate cannabis into the already-existing tourism culture — not to wave it prominently ahead of all of Humboldt's other draws. 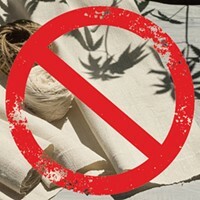 He said cannabis should be "a button on the shirt, not the other way round." Jodrey pointed out that legalization has so far had a serious financial impact on the area. "Overall, the county is experiencing a downturn," he said, adding that he is a long-time resident who plans on staying and raising his 5-year-old child here. He urged all the disparate groups to work together because the county would be better served by unity. "I do everything I can to keep the money in town," Jodrey told the group. "It is really better if my neighbor has a job." He said he was determined to make the cannabis business and other businesses thrive. "I'm not going anywhere," he stated. "Here is where we fight." He talked about plans to funnel tourists who came to the One Log business at the southern border of Humboldt County to businesses further north. He mentioned wineries, the Lost Coast, Avenue of the Giants, Ferndale, Old Town, the Sequoia Park Zoo and Trinidad, as well as cannabis businesses. 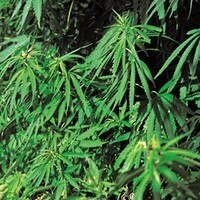 He pointed out that the average customer in One Log's cannabis shop has made purchases totaling $50 to $70. His not-so-subtle point is that these were desirable tourists with money to spend. As the group left the first stop, one member leaned to another and murmured, "He's saying all the right stuff." The tour then drove out the winding Briceland Road to the site of Johnny Casali's Huckleberry Hill Farms. Beside a pond and a cannabis greenhouse in flower, Casali talked about his dreams as a small farmer (he cultivates under 5,000 square feet of marijuana) and his work with the community. Casali says he supports several nonprofits including Sanctuary Forest and the Veterans Cannabis Group, for which he grows a therapeutic but not psychoactive cannabis strain to donate. One of his cannabis strains is part of Willie's Reserve — a brand owned by country music star Willie Nelson. Another strain was featured in a cannabis swag bag offered to film glitterati at the Oscars by his distributor Flow Kana. Casali spent his childhood on the property. In a voice occasionally choked with tears, he described being arrested and charged federally with growing marijuana in 1993. He spent eight years in prison. His mother died while he was incarcerated. Today, he is the only permitted farm in the valley. "John has always been a good guy," said recently retired Humboldt County Sheriff's Lt. Kenny Swithenbank, who attended the tour. "I knew him when he went away." Casali said he loves his community in part because it was so supportive to his family. "When I walked out of jail, there was 50 people sitting in my front yard waiting to help," he said with tears in his eyes. "My goal is to take care of the people that supported me in my time of need." Galen Doherty, program director at Sanctuary Forest, spoke after Casali. 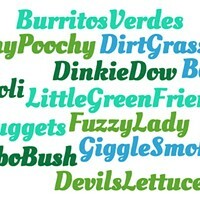 He said that his organization received a great deal of support from cannabis growers. Because of marijuana's illegality, people who cared about the environment in the underground industry "haven't had an opportunity to demonstrate their commitment to the environment," he explained. "We raised over $500,000 in 14 months for Sanctuary Forest," in part, because of cannabis growers. "It is not what you are growing but how you are doing it," he said. As the tour wrapped up, Terra Carver, executive director of the Humboldt County Growers Alliance, told the group, "We look forward to a long and prosperous future together." Editor's note: This article was first published on www.kymkemp.com and is reprinted here with permission.